Easter dining is all about the produce and gourmet. We’re talking pineapple skewers, apples in Easer salads, pear salads, mashed potatoes, vegetable side dishes, trays of relish veggies, dips and platters. Don’t forget about bowls of grapes- all colours and sizes, passionfruit pavlovas, toffee apples and apple pies. There’s also plenty of exotic fruit on the shelves with custard apples, dragon fruit and guava. Try freezing custard apple flesh for sorbet! Valencia oranges are very tasty and many varieties of apples are now on the shelves including new season Jazz, Gala, Red Delicious, Rockit and Kanzi. Gourmet is a big seller at Easter including dips, seafood, sauces, baguettes, crisp breads and antipastos. Ensure you order enough backup supply of dressings, sauces and dips. Whether it be antipasto, dips, seafood condiments or sweet treats we have it in stock ready for you to boost Easter sales! 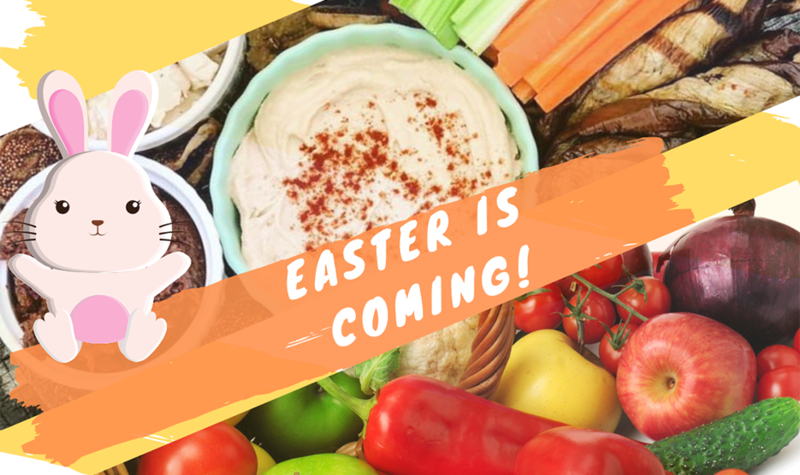 Premium ranges from In Season Gourmet Foods, Segreti Australia, Roza’s Gourmet and Chocolate Grove will turn your Easter feasting from ordinary to extraordinary!! Talk to your buyer today to see how to maximise your Easter sales today!